Congratulations to our Epsilon Sigma Phi (ESP) Michigan Alpha Psi Chapter who received the highest award – Chapter of Merit – Platinum Award – at the ESP National Conference in Wilmington, North Carolina, which took place October 9–12. The Chapter of Merit recognition program was developed by the National Board to provide recognition for those chapters who have put forth an exemplary effort to forward the cause of the Extension system and to provide professional development opportunities for their members. Award efforts are scored on several criteria and each chapter receives an award category, Platinum being the highest. The Michigan Chapter received the highest award in the North Central region and nationally. Shari stopped by yesterday and brought the award so that we can display it proudly in our office. Andy Northrop, Michigan State University (MSU) Extension educator, works with communities statewide to create and maintain sustainable communities using tourism and economic development. He is the chair of the tourism team for our Greening Michigan Institute (GMI), and he is also on the government and public policy work team. Andy has built connections over the past two years by consistent networking and needs assessment in the communities where he serves. In St. Clair County, in MSU Extension District 10, Andy built a relationship with the St. Clair County Economic Development Alliance (EDA) and The Blue Water Area Chamber of Commerce. The EDA and the Chamber of Commerce became partners in hosting the Connecting Entrepreneurial Communities Conference in 2016. Their collaboration on the conference brought together planning agencies, the Michigan Economic Development Corporation, private investors, nonprofits, educational professionals, and a number of partners and interested citizens in seeing Port Huron’s rebirth and vision for fostering a culture to support entrepreneurs. The conference drew 138 people, who traveled from two countries, five states, 27 counties and 58 communities. Andy, like many of you, works to create connections across the state as well. He has developed key partnerships with Region 6 of Gov. Snyder’s Prosperity Initiative (RPI 6), which comprises seven counties across MSU Extension Districts 9 and 10. One key partner in RPI 6 is Genesee County Planning, which has been instrumental in strengthening our relationship by employing GMI’s tourism team to deliver four First Impressions: Assessing Your Community for Tourism (FIT) programs during 2017. FIT, officially offered in 2017 for the first time, assesses communities through the eyes of first-time visitors. Four teams of four educators from GMI will conduct unannounced assessments as tourists to four communities across RPI 6 during the spring and summer of 2017 and work directly with their community leadership teams to strengthen their rural tourism industry potential. This program was adapted to Michigan by modeling from program partnerships with five Northeast Central for Rural Development land-grant universities. It will be the first of its kind to be offered under Extension in partnership with a prosperity initiative. The four successful communities will also receive state funding from RPI 6 to implement the suggested results from assessments. In 2017, the program is already serving as a cross-workgroup program within GMI. The tourism team envisions this being a cross-institute/Extension-wide program where experts across all four institutes can be tapped to move rural community tourism development forward. “Overall, these partnerships have positioned GMI and other institutes as reputable partners in areas related to business and economic development, sustainable tourism and placemaking,” Andy said. Congratulations to our Michigan State University (MSU) Extension teams who received four awards at the National Association of Community Development Extension Professionals (NACDEP) 2016 conference June 26‒29 in Burlington, Vermont. The Master Citizen Planner Webinar Series earned the 2nd place National Educational Technology Team Award. The program won 1st place in the North Central Region. Team members include Brad Neumann, Glenn Pape, Dean Solomon, Kurt Schindler, Julie Pioch, Andy Northrop and Ingrid Ault. Placemaking as an Economic Development Tool received the 2nd place National Educational Materials Team Award. It was 1st place in the North Central Region. Team members include Brad, Kurt, Glenn and Mark Wyckoff. The MIplace Initiative earned 2nd place nationally for the Excellence in Community Development Team Award. It was also 2nd place in the North Central Region. Team members include Brad, Kurt, Glenn, Mark and Wayne Beyea. Michigan Citizen Planner Long-Term Evaluation Project earned 2nd place in the North Central Region in Excellence in Teamwork. Team members include Brad, Glenn, Dean, Kurt, Wayne, Bethany Prykucki, Ann Chastain, Dr. Patricia Crawford (School of Planning, Design and Construction) and Rohit Menon (graduate student). Please join me in congratulating our colleagues on their excellent work. Michigan State University Extension educator Andy Northrop presented before the Michigan House of Representatives Tourism and Outdoor Recreation Committee about the program Understanding Tourism for Michigan Communities at their standing committee meeting on Sept. 9. Andy is the current chair of the MSU Extension tourism group, which has been providing the program to rural communities around the state since last year. Rep. Bruce Rendon, Michigan House Tourism and Outdoor Recreation Committee chair, learned of the unique MSU Extension program and asked Andy to present an abbreviated version to the committee. During the presentation, Andy focused on showing the representatives what the program is and how it is used as well as the results they have seen from the program this past year. 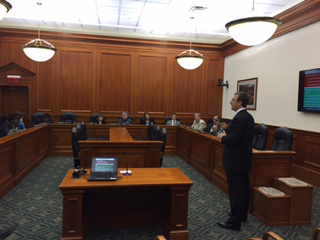 Michigan State University Extension educator Andy Northrop presented before the Michigan House of Representatives Tourism and Outdoor Recreation Committee about the program Understanding Tourism for Michigan Communities at their standing committee meeting on Sept. 9, 2015. Designed for people trying to develop tourist attractions in their local communities, the Understanding Tourism for Michigan Communities workshops show participants how tourism is changing and how they can use their assets to increase best practices in their communities. The typical audience attending a workshop ranges from Chamber of Commerce members to college staff to the public. In 2014, the MSU Extension tourism group hosted seven program workshops across Michigan, reaching over 150 participants. The program aims to focus on niche markets, including promoting creating a niche market in the community through agricultural, nature-based and cultural tourism. The program emphasizes regional and community collaboration, encouraging communities to work together to see how they can leverage their assets as a team. I would like to commend Andy on an excellent job presenting to the committee. The presentation raised awareness for MSU Extension’s work in this area of tourism. Thanks to you and the team, and congratulations on your success and recognition for this program!